2014 marks the first year since 2009 where we have not planned a Hawaiian vacation…seriously?!? How can that be? It just so happened that we had some family commitments and limited vacation time this year, but that doesn’t mean we won’t get our usual dose of travel and Aloha in 2014. We completed a 2 week jaunt to Asia in January, and we’ traveled Southern California to visit Steve’s dad who’s doing well, recovering from heart surgery. I still have my yearly Disney World trip scheduled for September with my sister (staying at the Polynesian! Aloha!) and then back to California right after that for a dear friend’s wedding. Steve is in the wedding party so he will not be joining us girls in Orlando, but he’ll probably be doing some traveling with the groom-to-be during that time. Our final trip of the year is one that I’m super excited about (and it’s not Hawaii!?!) – we’ll be spending a week in Bali in November for our 6th anniversary! It’s our first time to Bali and we’re super stoked. 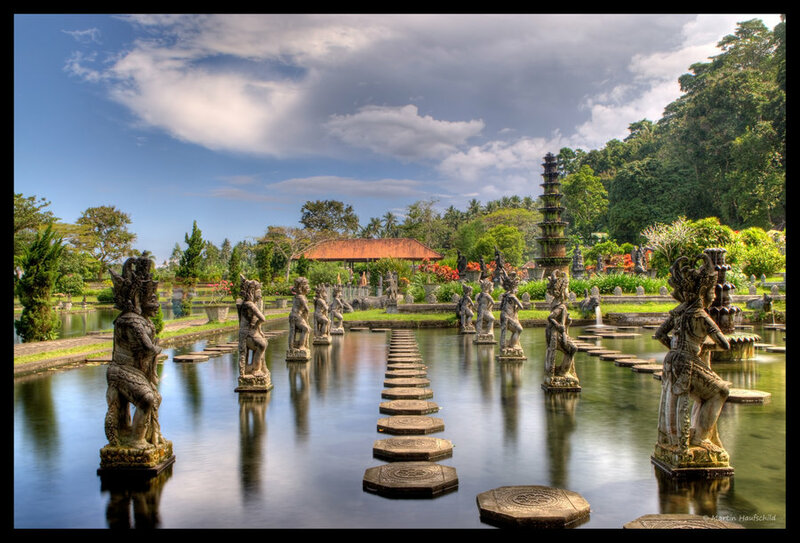 It’s not only visiting Bali, but the actual journey there that I’m looking forward to as well. We’ll be traveling mostly in international first and business class, all booked via United miles (and about 80 dollars in taxes pp). It’s our first time flying international first class! I will share more about the trip details and the partial nightmare trying to book it but in the end I hope it’ll all be worth the frustration online and on the telephone with star alliance agents! We started the year in January with a two week trip to Taiwan and Singapore, which was fantastic. We left NYC in a huge blizzard, but surprisingly our EVA air flight made it out (after a 3 hour delay in the plane). Fourteen hours later, we arrived at Taipei’s Tao Yuan International Airport. We got a car service to take us to our hotel in Taipe’s Nei Hu district which is where Steve’s family lives. Steve’s parents, brothers, sister-in-law, and adorable niece, Maddie, had arrived a few days before us and so we all met up at the hotel. 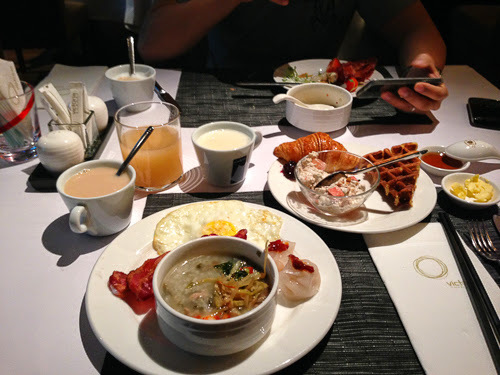 The included breakfast buffet at almost all hotels in Taipei featured amazing selections of western and Asian cuisines. 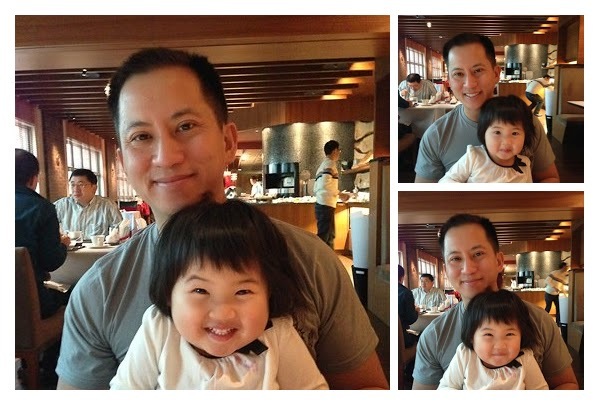 The 6 days in Taiwan was spent with family (Steve’s Grandma turned 90 years old! ), and taking a “party bus” all over Taiwan. Grandma’s 90th birthday celebration. That’s Steve’s dad singing karaoke. Steve’s family made sure we ate well…we ate these live king sized crab which were brought to our table and then prepared grilled and in a soup. Steve and his brother in front of the “party bus” which Steve’s extended family rented for a few days. It even had karaoke machines! We spent a night at a Japanese-insipred hot springs resort in Beitou called the Radium Kagaya, where you could take baths in your room with with sulphuric-scented (but highly theraputic) water from the nearby hot springs which is piped right to your room. We had a beautiful Japanese kaiseki dinner where we dressed in traditional Japanese attire. It was a fun and unique experience! In Beitou, there are streams fed by the hot springs and many order generic lamisil people like to dip their feet in there for it’s therapeutic properties. The bathroom in our suite at the Kagaya where you can take baths with water piped in from the hot springs. In our Japanese attire. The reflection is making it seem as if I’m wrapping the kimono the wrong way (R over L instead of L over R) but we followed the instructions they gave us! They even had children’s outfits for rent too! We visited a national park/garden which was where one of the houses of Chiang Kai Shek is located. There were a lot of visitors, and the gardens were pretty. One of Chiang Kai-Shek’s vehicles. The entire place was like a museum. We stopped in Sanyi for lunch and a quick walk around. It’s like a thriving local artisan community. We ate a traditional Taiwanese places a lot and this one had very local flavors. Cage-free chicken and assorted delicacies. The town of Sanyi where you can buy hand made wooden items. Steve got himself a back scratcher, LOL. Back in the party bus, the next location was one of the most scenic places I’ve ever been to, Sun Moon Lake. The lake and the surrounding mountains are absolutely stunning, made all the more better by some beautiful sunny weather. It was in the middle of January and it was 70 degrees out! How could you not love waking up to this view every day? We stayed at the luxurious Wen Wan resort. It boasts beautiful views, a lovely outdoor jacuzzi and pool, and an amazing spa. The guestrooms are large and spacious with views of the lake. Highly recommended! Gorgeous pool deck at the top of the Wen Wan resort. The lovely spa area where we got great massages. They wash your feet before you get your massage in little basins of water. Still can’t get over this view…!! The luxurious bathrooms in the guestrooms have the amazing view right from the soaking tub with floor to ceiling windows. Dinner at the restaurant at the Wen Wan Resort included some pretty exotic options including this curry crab sauce over sauteed mushrooms. It sounds so odd but it worked! One of my favorite vegetables, kong xin chai which literally translates to empty center vegetable. Breakfast buffet here was probably one of the most extensive buffets I’ve encountered. I swear, eating breakfast in Taiwan is like eating breakfast, lunch and dinner! After Sun Moon Lake we moved to a resort that’s very similar to Disney’s Animal Kingdom – the Leofoo resort. Stay tuned! P.S. Sorry for the lack of updates over the past month or so! Will get back to regular posting soon! © 2019 A Splash of Aloha – Food and Travel From Hawaii to Disney World and Beyond|ProPhoto WordPress Blog by NetRivet, Inc.